Demi sat holding Kesha&apos;s hand. Kesha wasn&apos;t awake very often and when she was she wasn&apos;t very coherent. Kesha&apos;s parents didn&apos;t visit her often and when they did it was only to make sure Demi wasn&apos;t there. Demi was there, of course, but there wasn&apos;t anything anyone could do about it. Diana had gone home. She had wanted to stay but there was some drama with Maddie. Apparently some kids at Maddie&apos;s school had heard about Demi&apos;s mysterious trips to hospital in England and were bullying her. They said that Demi was crazy and back in rehab. 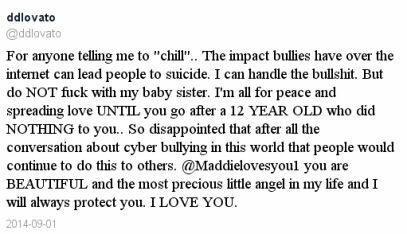 Maddie could handle it if people teased her, but not Demi. She adored her big sister and wouldn&apos;t let anyone speak bad about her. Diana had told Demi this. Demi had been very upset and went to Twitter. Please leave my baby sister alone! Our lives are none of your business, so please mind your own business! Demi&apos;s fans accepted this and backed Demi up, the press weren&apos;t happy though. They simply got even more nosey! Soon they were swarming around the hospital, making it hard for Demi to leave! But she didn&apos;t want to. She didn&apos;t want to leave Kesha&apos;s side ever again. "I&apos;m sorry," she thought as she stroked Kesha&apos;s hair. "I wanted to help you, I really did. I still do..."
Kesha wasn&apos;t aware that Demi was there, but she wanted her to be so badly. "Demi," she thought over and over. "I need you. Demi, I need you. Help me. Make all the demons go away. They hurt, Demi, they hurt..."
The pain Kesha felt was very real. She was trapped inside her own mind.